Thanks to a core group of generous supporters, we’re more than a third of the way to the campaign goal of $90,000. Did you make the list, yet? If you did not, and even if you did, donate today for better trails tomorrow. So what’s this campaign all about? 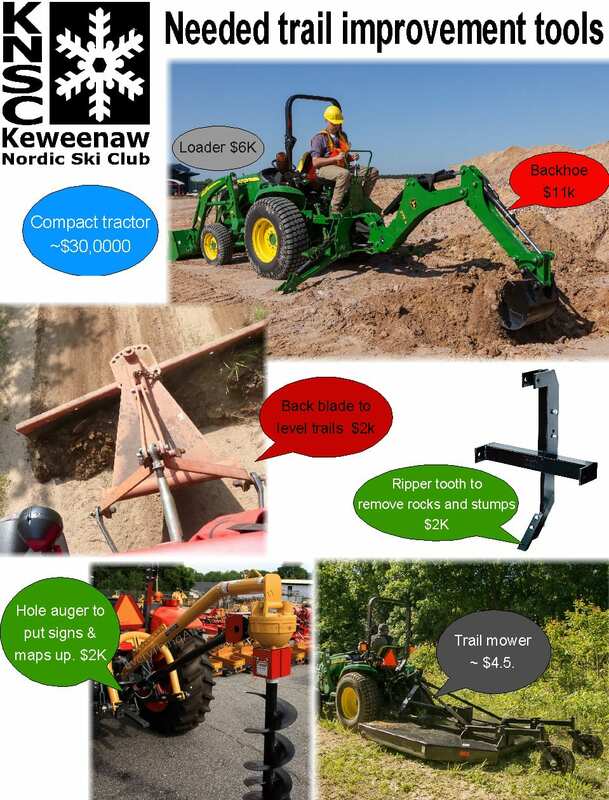 In accordance with KNSC’s 5 year vision plan, the funds from the campaign will be allocated to purchases of equipment and materials for trail improvements for earlier and later grooming. How would earlier and later grooming be accomplished? By keeping water off of the trail plus creating a level tread. These significant improvements are all possible with a small tractor and implements. 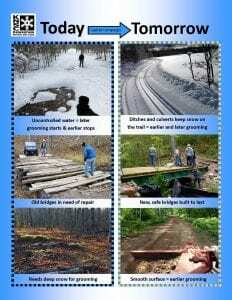 We learned this while working to replace the Middle Bridge, when we rented a compact tractor and were able to make trail corrections quickly and easily. Work that would have required dozens of volunteers toiling for hundreds of hours was accomplished by one person operating the tractor! 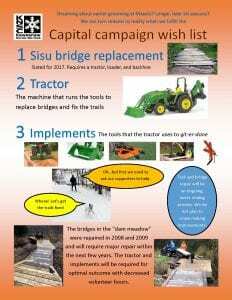 Speaking of improvements, we are planning for the Sisu Bridge replacement, which will also require a tractor. The bargain-basement rental fees charged during the Middle Bridge project are no longer available: to rent the same equipment for Sisu will be four times more. This project cannot be completed without a tractor, loader, and backhoe; it is not possible to recruit enough volunteers to do the back breaking work that the equipment will easily handle. 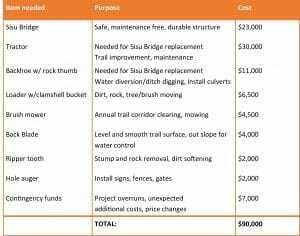 So, how do we gain funds and support, not only to replace another major bridge, but also to purchase a tractor and implements for its installation and for ongoing trail improvements? 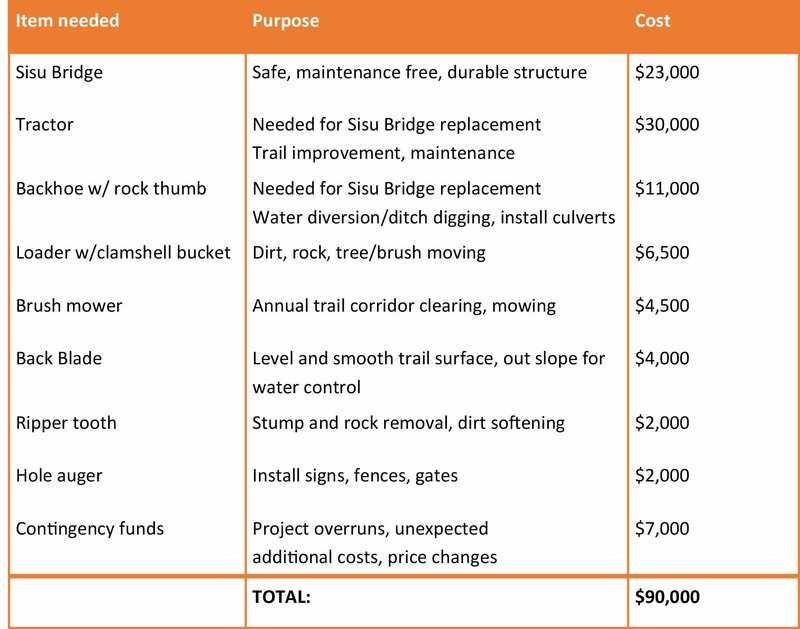 The materials and equipment required to meet our trail improvement goals will cost $90,000. Did you know? 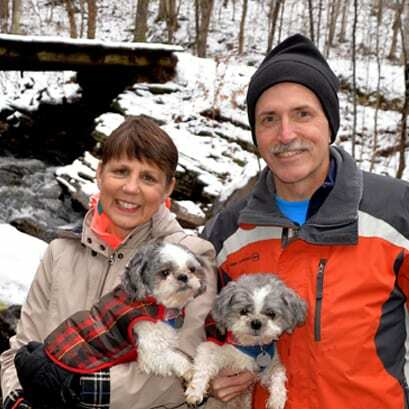 Local residents Keith and Julie Meyers, and Keith’s father David (they and the late Beatrice Nurmi Meyers all have strong ties to Hancock and the Finnish culture), stepped up to fund half of the Sisu Bridge project in exchange for naming rights. Read more about this phenomenal gift. Julie and Keith with ski partners Red and Blue. Sisu bridge seen in background. What’s the 5 Year Vision all about? Click on this poster to view full size. KNSC’s vision is to improve the trails to allow for earlier grooming, and longer seasons. Today, Maasto/Churning grooming starts weeks later, and ends weeks before other local trail systems. Why? Stumps, rocks, and rough surfaces require deep snow for grooming. Uncontrolled water crosses multiple trail areas. The River Trail is our system’s crown jewel, but the six bridges that get us safely across Swedetown Creek present ongoing maintenance needs. Good news! These problems can be repaired, with the right tools and equipment. What all is included in the campaign? Raised funds will be completely earmarked for making improvements to the trail system. 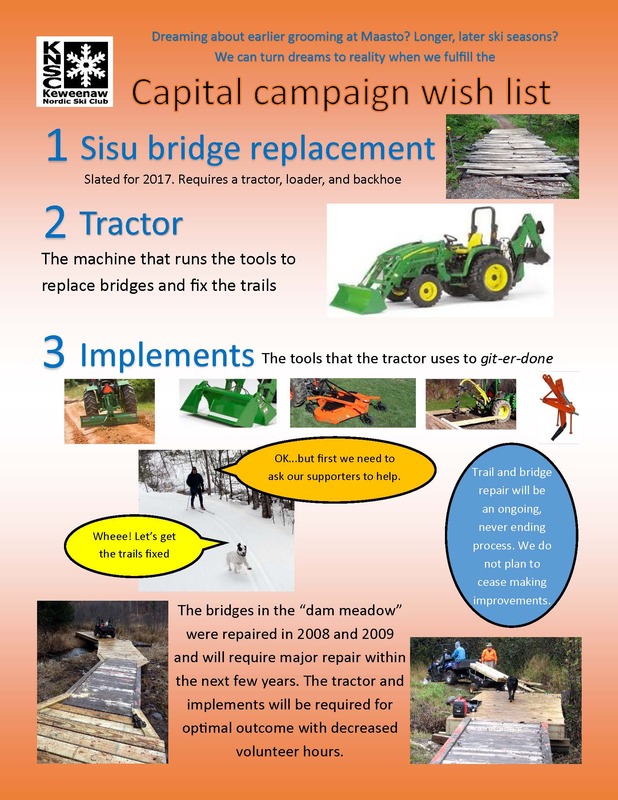 Specific items to be funded include materials to replace the Sisu Bridge, a tractor, loader and backhoe to install the bridge plus repair the trails, and additional tractor implements for trail enhancements. The campaign is off to a great start, thanks to financial support from David, Keith, and Julie Meyers, plus the entire KNSC board and many retired board members. Can you step up, to ensure the entire “wish list” is fulfilled? Donations, pledges, and in-kind gifts are all welcome and appreciated. What will the tractor and implements cost? This poster is an abbreviated summary of most of the tools needed. Click on it to view full size. Clearly, on top of the equipment priority list is the tractor, backhoe, and loader, as they are needed not only for the Sisu replacement project but also for repairing wet areas. Next on the list are trail surface smoothing tools: the back blade and ripper tooth. Clearing the trail corridors of grass, weeds, and brush is an annual labor intensive chore today, but with a heavier duty “brush hog” type mower this job would be accomplished with a fraction of the volunteer hours and effort. At the bottom of the list is a hole auger, which will save countless hours of volunteer effort and time when installing signs, fences, and gates. Click on this table to view it in full screen size. For our “numbers people”: here’s how we determined our campaign Grand Total. Note that Sisu Bridge replacement cost is $23,000. This reasonable price is for materials, only. It does not include contractor’s fees, thanks to hundreds of hours of volunteer labor that KNSC will supply. Many people realize, volunteers are very hard to come by. For the Middle Bridge, two key people did about 70% of the project, with a handful of others contributing 20%, and numerous others rounding out the last 10%. We owe it to our volunteers to lighten their load with the right tools and equipment! 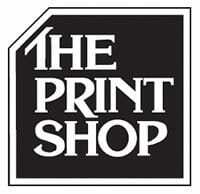 How can I help? Donate today! Better yet, set up a recurrent donation – a pledge. Pledging is a great way to give. For example, a pledge of $1,000 given over 5 years is a very affordable $200 a year. This type of planned giving helps your budget, and ours. 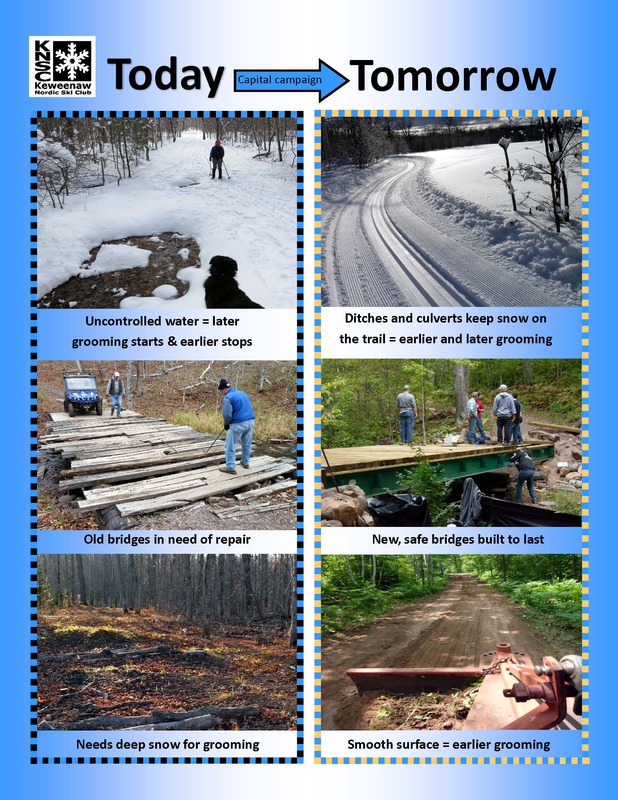 Give today, to make our trails safer, easier to maintain, and better to ski, snow shoe, and snow bike on!